In GemCraft: Chasing Shadows, there are seven fields which have a special compass item. The game never explains the purpose of the compasses, though the first thing you'll note is that on the loading screen of a compass level, there are seven gem outlines shown. I googled around but did not find anyone else who has explained the compass puzzle, so here's my explanation. Spoilers (but not plot spoilers) follow. The loading screen shows how close or far each compass is from its solution position, with a level 5 gem indicating "correct" and a level 1 gem indicating "180 degrees wrong". The compass fields are (in order): C2, E3, J2, K2, O3, U4, X7. So in the screenshot, C2 is the last compass to be solved before getting the next reward. If it shows "level 2", click it 3; Either it'll be correct or it'll show "level 3" in the next play; if so, click an additional two times. If it shows "level 3", click twice. Either it'll be correct or it'll show "level 1" in the next play; if so, click 4 times. If it shows "level 4", click once. Either it'll be correct or it'll show "level 3" in the next play; if so, click 6 times. If it shows "level 5", it's in the right position already. Don't click. Or click 8 times if you must. For a change in compass direction to stick, you have to win the level. 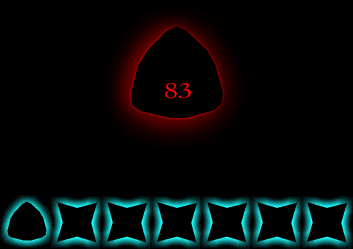 When you complete a level with all the compasses correct, you will get an additional drop. The first additional drop is a field token for secret field D6. Next time you play in a compass field, there's a new code to solve. There appear to be 11 compass drops in all, 5 high-level fragments and 6 field tokens. There are no compass achievements after the first one for spinning a compass at all. The codes are random to each savegame, so there's no use in telling someone "turn the C2 compass north" or the like.